Melt 250g butter with three (or two, but three is better) 200g blocks of dark chocolate. Use a low heat, just enough, and start the butter melting before adding the chocolate in pieces. Take off the heat and add a tin of sweetened condensed milk (397g). Smash two 250g packets of milk arrowroot bickies. As a guide, you want pieces of various coin sizes, not crumb dust. (I do this while the butter and chocolate are melting). Mix all together in a big bowl (you'll need a big bowl for it all). Aim to have all the bickie bits coated in chocolate. 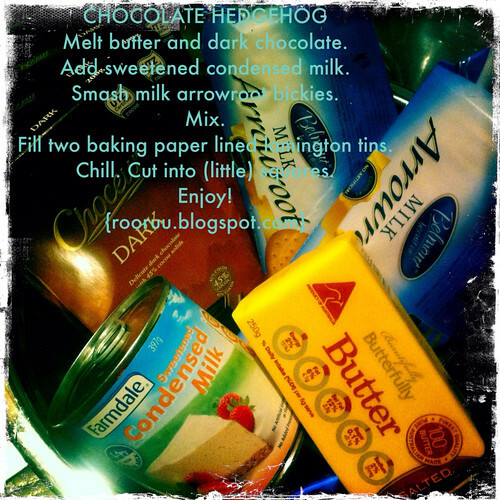 Line two lamington tins or one larger Swiss roll tin/cookie sheet (one with sides) with non stick baking paper and fill with chocolate hedgehog mixture. Press down gently. (Confession: the recipe which inspired this used three tablespoons of cocoa as the total chocolate input. I felt this needed revision...tried two blocks of chocolate, but three was better :-) ). You could add other things, like raisins or nuts or marshmallows, but then it's heading off towards rocky road territory. This is your standard hedgehog, bickies in chocolate.